The award-winning team with the design on display. 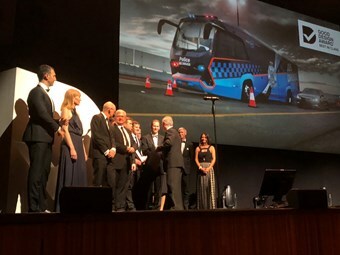 The team behind the bus, Victorian-based Brimarco Byron-Wade, was presented with the Good Design Award Best in Class in the Product Design Category by special guest Jan Utzon, son of Opera House designer Jorn Utzon. Brimarco Byron-Wade won the award in recognition of the outstanding design and innovation it incorporated into the bus, built as part of a contract with the Victorian Government to design, engineer and build 10 ADT vehicles for Victoria Police. 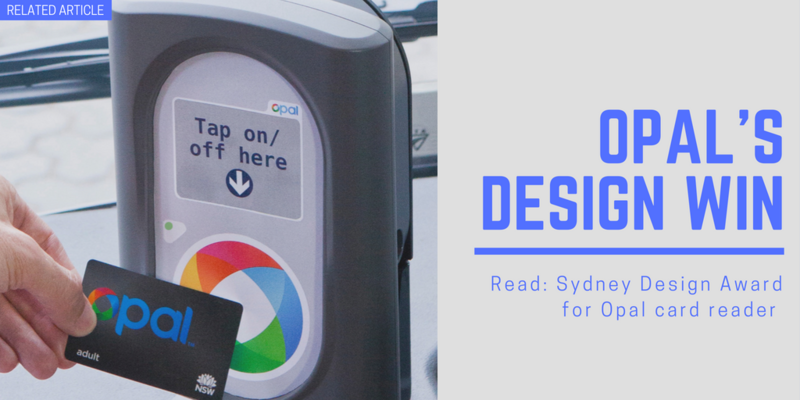 Brimarco Byron-Wade engaged Cobalt Design and Ottimo Design to provide design and engineering services for the project, along with other specialist sub-contractors, the company states. The project team is the same one that supplied the previous fleet of Victoria Police ‘booze busses’ in 2014, which also won an Australian Design Award. Key features of the design include low-floor height; zoned work areas with computer access for drug and alcohol testing purposes; staff rest areas; front and rear external and internal storage solutions; night security for active staff, with high visibility exterior LED lighting and information signage systems, it’s stated. Alongside the excitement of winning the award comes news of Brimarco Byron-Wade’s 10-year exclusive licence to manufacture and sell the state-of-the-art ADT vehicle design nationally and internationally to government departments and approved companies. Brimarco managing director Matt Kirwan-Hamilton said the team was proud that the project had received such prestigious external recognition. "Victoria Police has been such a fantastic organisation to work on the project with. Ultimately, it was their vision and faith in our team that allowed the ADT vehicle project to become a reality," he said. "Winning the new ADT fleet contract in 2017 was a real catalyst for growth in our business and was a factor in the creation of 26 new jobs in Ballarat (16) and Derrimut (10) over the last two years. We look forward to growing our team even further as new opportunities are realised." Taking delivery of the first bus in March, 2018, Victoria Police assistant Commissioner Doug Fryer said their design follows the tradition of innovation that has been the hallmark of the Victoria Police mobile alcohol and drug testing campaigns. "The new buses have been designed with enhanced safety measures to keep our members safe and include LED flood lighting technology, one step entry with an internal flat floor, front and rear storage areas for equipment, and state-of-the-art electronic control systems," Fryer said. "This will allow for easier set up and pack up meaning the buses can be moved more easily to cover more areas for testing." The Brimarco Byron-Wade ADT buses have gone above and beyond their expected brief, with regards to local design and material content, cost and delivery timing, the company states. The rest of the new buses will be built over the remainder of this year and into early next year.